We are excited to put out a call for new board members as we prepare to kick off a new year. 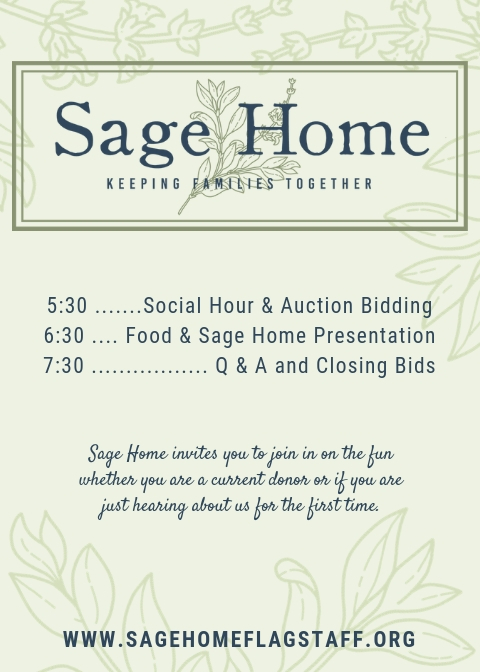 Sage Home is delighted to be hosting our First Annual Silent Auction event this fall. See details below, and be sure to RSVP by Friday, October 19th if you plan to attend! 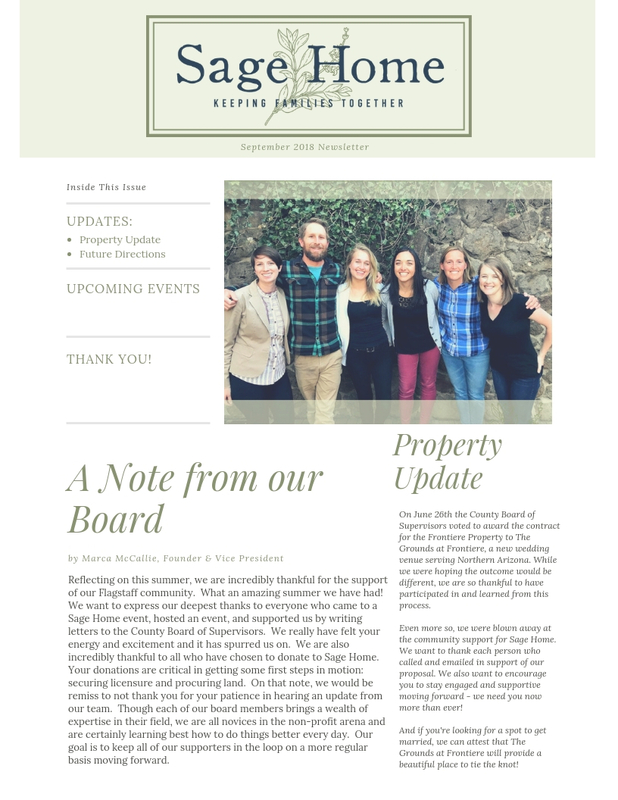 We would love to send you our newsletter directly. Sign up here if you would like to receive future updates. Help us with our proposal to the county! You may have heard that Coconino County has property up for bid near Rogers Lake. Sage Home is working hard on our proposal to use this land and we would love your support! By emailing or calling the county's Board of Supervisors, you can encourage them to consider Sage Home's proposal. We have included an email template as well as email addresses and phone numbers at the bottom of this post. Now it's time to rally and campaign! Please utilize this to call or email your representative today! I am writing to encourage you to consider Sage Home’s proposal for the Frontiere Property at Rogers Lake. I believe in Sage Home’s mission and know that it is much-needed in our Flagstaff community. In other states, we see that allowing mothers and babies to heal from substance abuse together is working more effectively than our current model of separation (Reno’s Step2 program boasts a 58% success rate compared to our 17% success rate). Moreover, the property at Rogers Lake is uniquely tailored to Sage Home’s mission and values. The location will allow for families to live in a therapeutic setting while building new skills and creating new patterns for healthy living. The property can serve multiple purposes as an event venue and retreat center, helping Sage Home to generate its own overhead costs while giving its clients invaluable work experience. Sage Home at Rogers Lake would be a win for Coconino County. I know you will agree upon careful reading of their proposal. Sage Home received our 501-c-3 status from the IRS! This is huge. We have been working on our application for a long time and are so excited to be able to move forward now that we have our non-profit status. Stay tuned, we have lots of work ahead, but can't wait to share with you as we continue to build the future of Sage Home. We will also have lots of ways to get involved, so click on "Take Action" if you'd like to team up with us!